For the past eight years Woodpecker has been crafting and installing white painted wooden greenhouses. The whole range of Woodpecker greenhouses are suitable for our painted finish. We now choose to use Accoya timber for our painted greenhouses instead of cedar as we find the finished paintwork has a more durable and lasting finish. 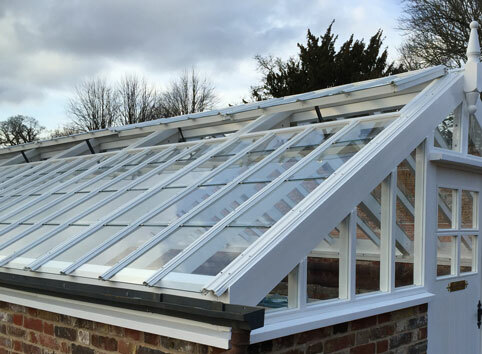 The paint applied to our greenhouses is specially selected for exterior use on Accoya timbers and provided by leading Oxford based paint manufacturer Teknos. The paint technology is based on a microporous system, which allows the timber to breathe but still creates a durable weatherproof barrier to protect the timber from the elements. Teknos paint is resistant to bacterial, mould and UV sunlight attack, meaning lower requirements for long term maintenance. Historically we have painted greenhouses made from Western Red Cedar, but with the advent of new timber technologies and species, we feel Accoya provides a better painted product quality and life time. At a customers request we can paint Western Red Cedar, but we would feel better applying paint to accoya and offering the best product we can achive. 13ft x 32ft Bespoke Lean-to Greenhouse, white painted finish, installed and delivered for £15,000 including Aluminium Roof Capping Upgrade. 12ft x 20ft Bespoke 3/4 Span Painted Finish Greenhouse, installed and delivered for £10,500 including Aluminium Roof Capping Upgrade. 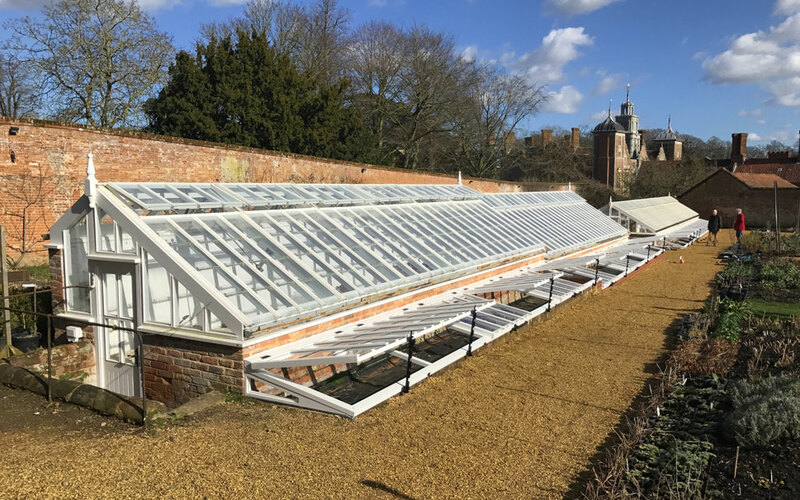 The above picture shows two 13ft x 60ft white painted bespoke greenhouses installed at The National Trust’s Blickling Hall Estate, Norfolk. The estate dates back to the 15th century and includes 55 hectares of gardens. We also manufactured and supplied the adjacent coldframes. The estate is open to the public and an ideal opportunity to see the craftsmanship of Woodpecker greenhouses, against the back-drop of Blickling Hall’s beauty and history. The greenhouse has been designed with 6″ x 2″ rafters to match the pre-existing building replaced by Woodpecker. 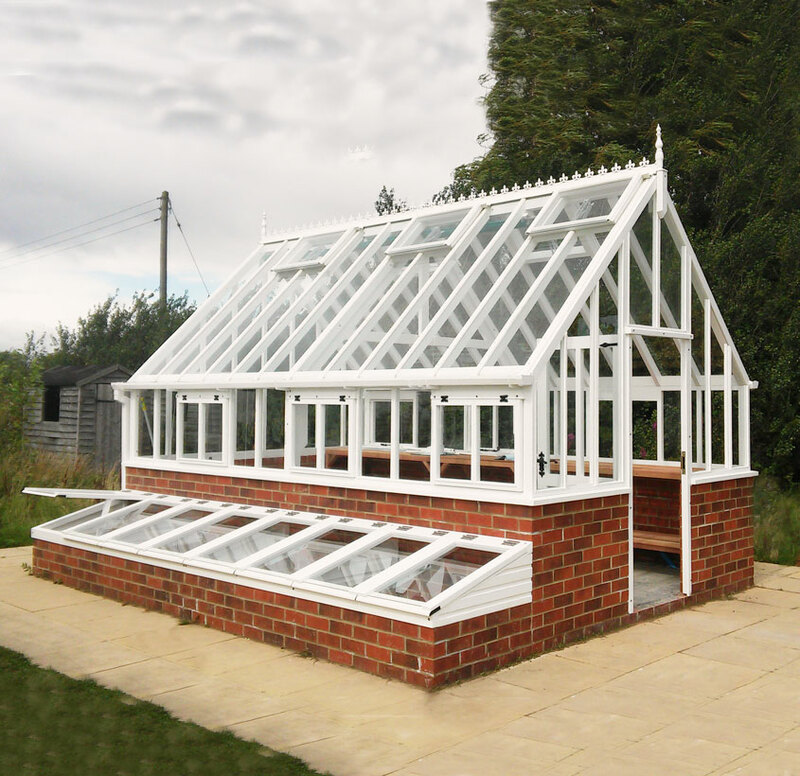 The greenhouse has also been designed to complement the existing manual mechanical ventilation system. By request of the National Trust to keep the same characteristics as the previous greenhouse, the roof glazing has been split into multiple pieces. The haunches fitted within the greenhouse ridge are typical of the late 19th century Boulton and Paul designed greenhouses. Sales & Helpline Tel: 01889 562 610 Email: greenhouses@wpjuk.com.